Some of the patterns in my books use this technique so I thought it high time I did a tutorial for you all. I tend to only use this method when working in the round for some extra detail and texture. Start by turning your work so you can see the wrong side. Note the top of your stitch where you will see the front and back loop. 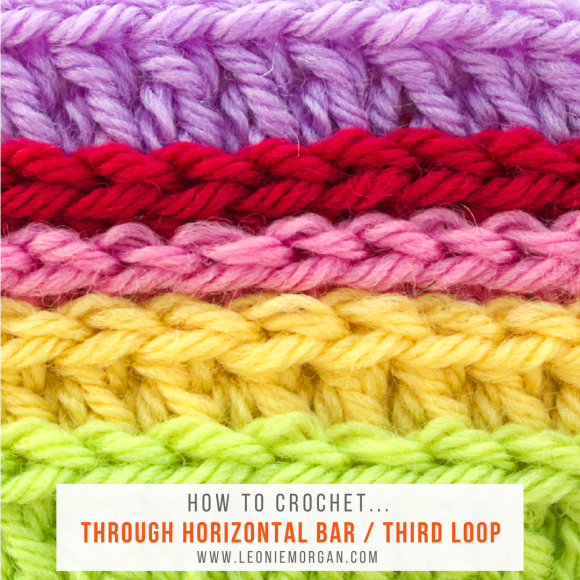 Just below those two loops, on the wrong side, you’ll notice a strand that lies horizontally – that’s the horizontal bar, also known as the third loop! Use a pointy hook if you’ve got one. Tilt your work towards you so you can see the horizontal bar more easily. 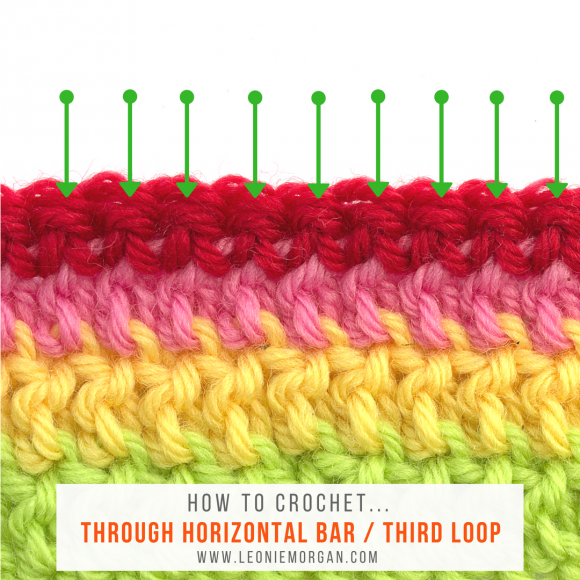 When you are working into a starting stitch at the start of a round (like a ch3) it will be harder to find the horizontal bar. Just use the nearest strand you can find! This works for whatever stitch you’ll be using. Turn your work to the right side and slightly tilt the stitch you will be working into forwards so you can see the horizontal bar. Insert the hook down through that horizontal bar. This can be a bit tricky and you may find it mighty weird and super slow at first. Do persevere – with a bit of practice it gets much easier – promise! Once you’ve poked the hook down through the bar just finish the stitch as normal. It’s as easy as that! When you are working into the horizontal bar of hdc (htr in UK terms) you’ll see the bar is at an angle and there are two of them. Just use the one closest to the top. This method of working stitches is also called Camel Stitch. 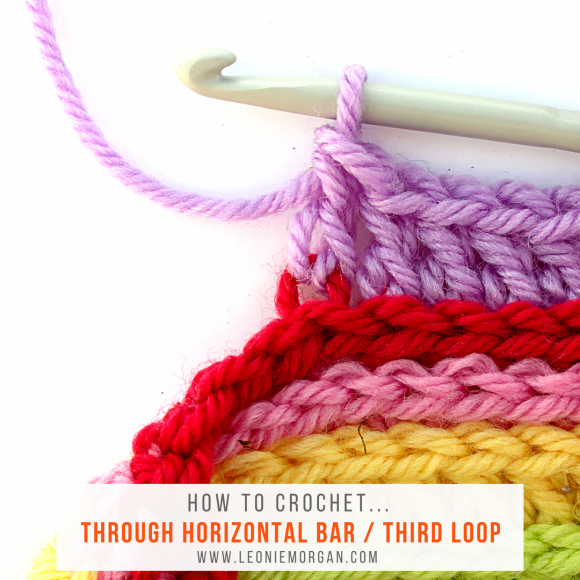 The horizontal bar is also called the third loop, back bar and lower back loop. You’ll see abbreviations of ‘thb’ or ‘whb’ in patterns preceded by the stitch you need to work – sc whb or sc thb for American folks and dc whb or dc thb for British folks. 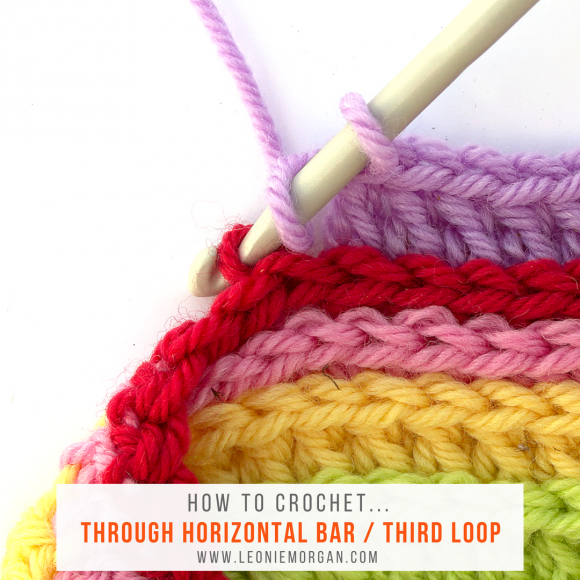 I hope this How to Crochet Through Horizontal Bar, or, How to Crochet in Third Loop tutorial helps you make sense of and conquer the skill.